That is really sad–and quite a mystery! I am really curious about what could have happened. As before, love the shot of you with the chicken. Chickens seem to flatter you! I sympathize on your loss of Maxine. It does happen. My experience has been that some do go at a very young age. I also know that liver disease can often be their demise, more often than one would expect. It does show up in weight loss and they get really lethargic, but I don’t think there is any cure. I just liked the site and your descriptions. Nice site. My sympathies, again, on the untimely demise of Maxine. I agree, the name should be retired. The next time you have a chicken problem, perhaps you could try calling your local county extension service? They may have contacts who could help. Maybe some sort of virus? My condolences. Do the other chickens show signs of missing her? How discouraging! Have you considered calling one of the universities’ veterinary schools for advice? Somebody, somewhere, has to know about chickens. Maybe Maxine had a heart condition. Our dog, Luna, started coughing but otherwise didn’t have any symptoms and she was diagnosed with a heart condition. I know you are sad to lose Maxine. I bet she was a happy girl while she lived with you. After all who would complain about living in a palace?? I’m sorry to hear about Maxine. That’s so odd. My husband and I currently live in Florida, but after the first of the year are relocating to North Carolina. One of the things I’m looking forward to most is building a chicken coop. When my friends hear this they say, “ooh, fresh chicken!” (as in roasted!) What?! No! They’ll be named pets, I just want their eggs… geesh! 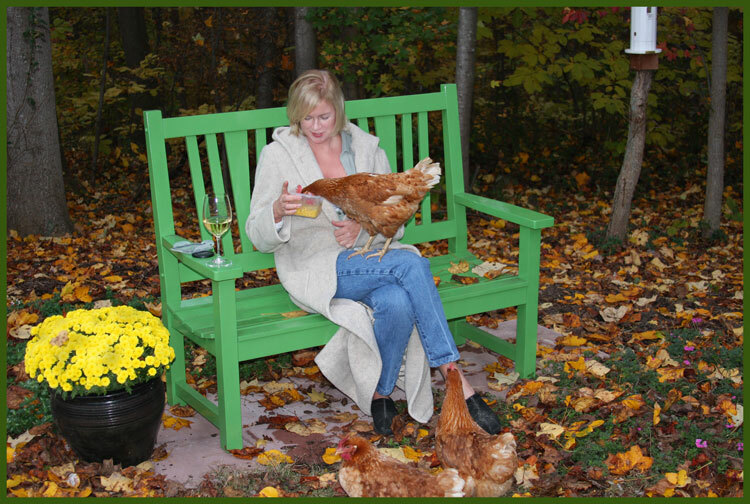 Yeah, this time next year, that could be me; bundled up, enjoying the crisp autumn air and a glass of wine while I feed and bond with my fowl! I’ve been following you blog for a month or two, now. It makes me all the more eager! Robin, I’m sad with you and for you about Maxine. I hope the rest of them will stay healthy and happy. You might think about talking to your local Extension agent if you haven’t already. Perhaps they would have some ideas about what happened. I’m sad for you on this — and can’t believe its been months since I checked your blog. I know one other person who recently added a chicken farm to her life who is also having the ups and downs of life with the chickens. Hopefully, the rest will remain healthy for years. One of the yucky parts about keeping chickens – especially ones we name. Perhaps the other chickens are trying to teach us a lesson – for every time there is a season. I did call the extension service, but didn’t get much/any help. And without paying for an autopsy, vet schools and such aren’t likely to provide much in the way of answers either. Live and learn. My first order of priority is to find a real vet who treats chickens as pets. The mystery of Maxine’s demise may go unsolved but her short life was filled with warm days, plump bugs and the loving hands and arms of her owner. Maxine will be missed. She was a beautiful bird! I’m sure there’s chickens in heaven if all dogs go there too. Sorry for the loss Robin. Hi there. Great posts 🙂 I’ve got a link to your blog from my own. No lol I’m not asking for a link back only to say that my husband is following you on Twitter so that I can read your posts. Keep up the great blog. I love it. So sorry for your loss. I’ve never kept chickens but have gone through my share of cats and dogs and I know it can be very rough, especially if you don’t know why they died! How curious. I’m with you: as a name, Maxine has got to go! My father has recently bought 3 chickens who we’ve named Milly, Molly and Mandy and regardless of what some people say, they really do have distinctive personalities and the loss of any loved pet / animal is always hard. Thanks for sharing and opening your heart with such a wonderful blog. I am so sorry about Maxine; you’re probably wise to retire the name, though it’s such a good name for a hen. I have heard of this disorder, something about the neck. I can’t be more helpful — my rural Indiana roots are far in my past. But it should be accessible somewhere. It’s not that uncommon, or wasn’t in my 1960s Indiana childhood. My mother didn’t have chickens (though she had in her childhood, growing up on a Wyoming ranch) — but she knew the name of this disorder. I envy your eggs. In the summer, I can buy them from a lady at the farmer’s market, but now I buy “free range” from the grocery store. So very sorry about Maxine. Since I have been looking at getting chickens myself, I asked my local vet about where to take them if they get sick. He suggested a vet that specializes in exotic birds. I found an exotic bird vet and YES they will see chickens. I spoke to some other chicken owners and they all said the same thing…Exotic Bird vets were the only ones that will see chickens as pets — At least here in California. Perhaps you can see if there is a vet like that in your area for any future sickness of your lovely chickens. I lost one of my sweet hens this Spring in what sounds like a very similar problem. I was fortunate enough to have a vet from the state poultry lab come look at her. He prescribed a general antibiotic but it was not effective. She died a couple of weeks later and the vet conducted a post-mortem exam and found that she had a very large lump of undigested grass in her crop which would not allow food to pass into her system. He said he had never seen this before and that to remove it would have required a surgical procedure which she probably would not have survived. Being a caretaker of animals definately has limitless rewards, but it also has its share of heart breaks. I am sorry for your loss. I am so sorry to read about your lovely Maxine. She was a beauty and I’m sure she did enjoy a spoiled life while she was with you. Not that this helps you, but our vet also specializes in birds and will gladly see chickens and ducks. He gave us great advice when we had a sick duck in the past… Sorry about your loss. Poor Maxine. My heartfelt condolences on the loss of Maxine. I, too, have experienced the helplessness of trying to find a chicken-friendly vet. But I’m glad to hear that the rest of your flock is doing so well. And your photo is priceless. Is the glass of wine for you or for the hen? I’m sorry to hear about Maxine. Poor thing. This is the first time I’m posting with you, although I’ve curiously checked in to see what’s going on occasionally. The name of your blog is what pulled me in, as I love bees, but I have to admit, I like the idea of chickens too. Although I always fancied myself more of a “duck type” of pet owner, if only I had the acreage and the blessings of neighbors. Good luck. I’ll keep looking in. Oh, poor Maxine! I had a friend in Oregon who enjoyed a flock of pet chickens, and oh my gosh the stories she used to tell! They are fun little creatures! We’ve thought about building a coup but we have visiting raccoons and our neighbor swears he saw coyotes in the neighborhood. I’m not sure we wouldn’t be creating a walk-thru buffet for the local wildlife! Last night I just recently lost my chicken, Lilian (Lily). In November I lost ALL 3 chicks that I got at the State Fair in August. Their names were Dakota,Luna, and Isabella (Bella). It made me VERY mad, becuz ALL of those chicks we’re pecked to death!!! Fortunetly Dakota was buried b4 all the snow came, but now I have Luna, Bella, and Lily in a box in my garege waiting for the snow to break!!! !